Approx 29.5 cm in length by 15.5 cm in height. The base is marked with a RINGTONS LTD. / NEWCASTLE / ON-TYNE / MALING WARE backstamp. SIZE: 8" (20.25 cms) high. Small area of roughness from manufacture to the base rim as pictured. 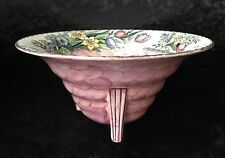 Art Deco rare shaped 3 footed bowl from Maling in the lustreware “Springtime” pattern. Features a border of spring flowers with a pink “thumbprint” base & gold trim. Conical shape on 3 legs. 9” diameter & 4.25” high. Nice condition for age, with some crazing & small chip on base of foot (as per listing photograph). Clear maker’s mark on base, and numbered 6525. Quite a scarce shape for this pattern. Maling LUCERNE Pattern Bowl from the 1930's. VGC, but with signs of wear. It is wear to the gilding on the rim and a few areas of light crazing. Gilding in generally good order. Light signs of surface use. A lovely Maling candlestick that would grace any collection. Maker :Maling. Marks :6506 E4 written in black and the Maling backstamp. Materials :Earthenware. Item : Bowl. Age : It dates from around the 1940s. Get images that. make Supersized seem small. Antique Ringtons Ltd Newcastle on Tyne Maling Ware. Maling Ware - Ringtons Ltd Flower Vase. Ringtons sold tea door-to-door. Association with Ringtons lasted until 1962. Maling Ware Ford Potteries. Newcastle upon Tyne, Northumberland. UNLESS OTHERWISE STATE ALL CHINA AND GLASS WILL BE SOLD IN GOOD USED CONDITION. Beautiful vintage bowl by Maling in blue thumbprint pattern with primroses in fantastic lustre glaze. It measures approximately 21.5 cm wide x 11 cm high and is in great condition with no chips, cracks, crazing or hairlines. There is some light rubbing to the gilt, please enlarge the photos for a good view. Rarely found in this fine condition and will be packed very carefully for posting. Thank you for your interest. I promise to pack with care and post with haste. Maker :Maling. Marks :6506 E4 written in black and the Maling backstamp. Materials :Earthenware. Item : Bowl. Age : It dates from around the 1940s. I have 6 sets of these beautiful, versatile tennis / snack / tv. Saucer 9" x 6". This is beautifully decorated piece of Maling Pottery that could be used at the table for sweets, nibbles etc. or simply for display. Maling of course are a top quality works and this little dish displays that quality. ONE OF THREE AVAILABLE AND A SINGLE SHALLOW BOWL AS LISTED. ~RINGTONS~. ~TEA MAN TOAST RACK~. Height: 4~1/4" appx. Width: 3~1/2" appx. One has a slight indentation scratch under the glaze and a small spot, also under the glaze, and a small amount of crazing on the underside. Both have had gilding to the rims but show signs of rubbing. Buy It Now on this oval tabbed serving dish from Maling and Made In England. Dish has a brght and bold floral pattern - main colour is green - dish has an opalescent finish. Fully back stamped with Maling mark. The green-blue back stamp shows a triangle with CTM surrounded by TRADE MARK ESTD 1762 ENGLAND. There is also a triangular impressed stamp reading CTM and a square impressed stamp which includes the date 5.01. Maling Plate ROSALIND, YELLOW 6446 or 7?. In very good condition. This plate is in very good condition. It has a few small flaws on its face and crazing front and back - pictures included. The parcel will be double boxed for safety. The design of spring flowers is different on each side so I have put on photos of each side! The pink "wave" design was freehand painted. The rims are gilded. Very clean inside the holders. 2" or 4.9cm across the top rim and 3.7/5" or 9.4cm across the bases. THE DISH IS IN GOOD CONDITION. ~PINK ROSES~. ~DISH / BOWL~. Height: 1~1/2" appx. Width: 6~1/4" appx. Length: 9~7/8" appx. The spoon and fork are reproductions and no maling stamp they are included in the sale. The backstamp on each depicts a castle and states: “Maling Estd 1762 Newcastle on Tyne England ” (possibly Art Deco as opposed to 1950s Retro as the backstamp states “England ” rather than "Made in England”?). Unusually for Maling I can't see any crazing to the glaze.